The Festivals list spans over one year only. You can display the year of your choice, by tapping the right/left arrows to jump the previous/next year. The CalJ app can compute any year in the future (or in the past). You don’t have to wait for the next New Year date in order to look up the dates of festivals. 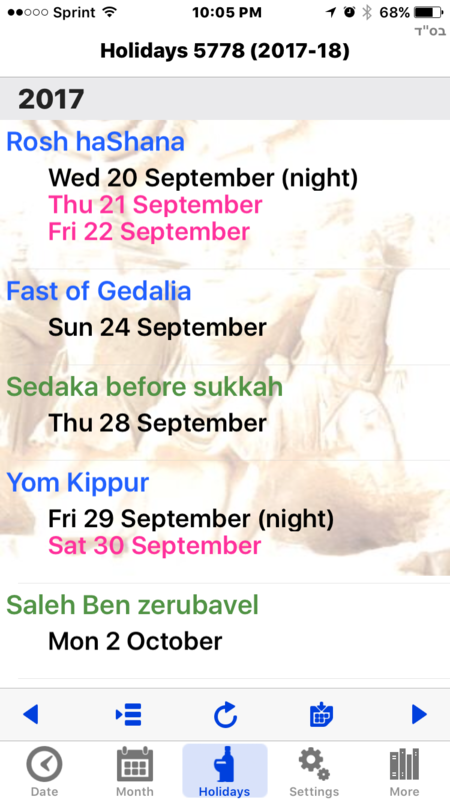 The list can be displayed in “Jewish Year” mode, or in “Secular Year” mode. In Jewish Year mode the list goes from Rosh HaShana to the next Rosh HaShana. In Secular mode, the list displays the secular year, starting January 1st, thru December 31. You can toggle modes by tapping the toolbar button shaped with a circular arrow. ← Can I export my Yahrzeits to my calendar? Hi Gabriel. The Holidays calendar ends in Dec 2017. How do I get to see holidays for 2018 and further? Ruth, thank you for using my app. Just use the arrows in the toolbar!